My collection got its first publicity in the October 2, 1998 issue of the College Street Journal. A few months later, the Spring 1999 issue of Vista had an abbreviated version of that same story. The October 11, 1999 issue of Barr's Post Card News featured me as Collector of the Month! The March 2, 2000 issue of The Mount Holyoke News ran an article about my collection. I did a display of some of my postcards at Mount Holyoke the weekend of March 3, 2000, and the College Street Journal ran a notice about it. The Spring 2000 issue of the Mount Holyoke Alumnae Quarterly ran an article about my collection. The April 2001 issue of The Postcard Collector mentioned my site as an example "that will give historical societies and collectors ideas on how to display their cards." 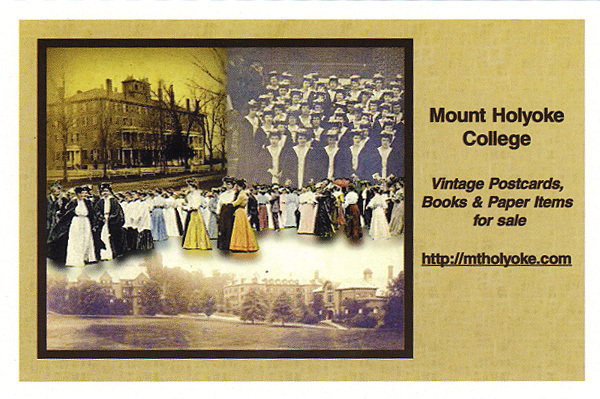 The May 3, 2001 issue of the Mount Holyoke News had an ad for my new book, with a scan of the front cover and the following text: "The latest book in Arcadia Press' "Postcard History Series" a collection of historical postcards from Mount Holyoke College. Written by Donna Albino '83, the book features postcards from 1898 to 1981. Albino reproduces the messages on the backs of the cards and provides historical background on the students, places and faculty mentioned. 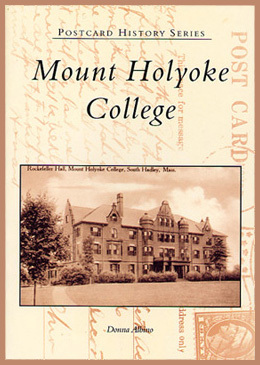 "Postcard History Series: Mount Holyoke College" is available at the Mount Holyoke bookstore and other local bookshops." The May 9, 2001 issue of the Chicopee Herald had a nice article about my new book, and my website. The July 12, 2001 issue of the Daily Hampshire Gazette had a nice article about my new book, and my website. The September 2001 issue of The Postcard Collector mentioned my site: "Mount Holyoke College is the subject of Donna Albino's collection posted on an interactive Web site. Take a look at www.mtholyoke.edu/~dalbino"
The April 2002 issue of The Postcard Collector mentioned my site: "Donna Albino loves her alma mater, Mount Holyoke in South Hadley, Mass. ; not only did she compile an Arcadia book about the school (check next issue for a review) but has also created Mount Holyoke Web sites, webcards and postcards. She sells blank-back webcards such as this collage to promote her site at www.mtholyoke.com and postcards from historic photographs of former students. The webcards are $1 each (or she'll trade for postally-used South Hadley cards) and the limited-edition postcards are $3 each (plus postage) if you mention this column (she'll also include a webcard with each postcard order). Write Donna Albino, 455 Belmont St, East Bridgewater, MA 02333 or email dalbino@mtholyoke.edu." The May 2002 issue of the Postcard Collector had a nice review of my book. The August 23-September 12, 2002 issue of "Unravel the Gavel" ran this article in their "Come Collect With Me" column. The November 25, 2002 issue of Barr's Post Card News featured a postcard from my website on the cover, and this article. The August 2003 and September 2003 issues of the Postcard Collector ran a 2-part article I wrote about the Underwood and Underwood real photo postcards of Mount Holyoke College. The October 2003 issue of the Postcard Collector ran a letter to the editor that I wrote in response to my article from the previous two issues. The October 2003 issue of the Antiques Roadshow Insider ran an article about college collectibles that had a paragraph about my collection. The Nov 2, 2003 edition of the Waterbury Republican American ran an article to advertise an upcoming booksigning I was doing in my hometown. The July 12, 2004 edition of the Linn's Stamp News ran an article about my collection and my desire to get the USPS to dedicate a postal card to MHC. The February 2006 edition of the Postcard Collector offered some of my custom postcards for sale.